Richard Oster sat on the first Board of Directors of the Alberta Construction Safety Association in 1989. He was representing the Medicine Hat Construction Association on the newly formed ACSA Board. This was the beginning of Art's Excavating becoming involved in the "safety culture." Richard started the process of taking courses and getting the manuals for the safety program together. 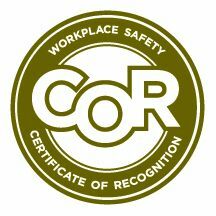 In 1993 we passed our first audit to gain our Certificate of Recognition (COR) from Alberta Labour which we have held successfully to this day. The safety culture in our company has grown and changed over the years. From the Labourer to the Owner all personnel take pride in our success in working safely. To sum up, we have had a long and successful history with safety in the construction industry. We are very proud of our success.